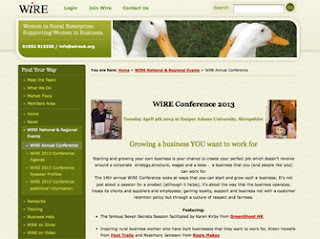 I had a day out of the office yesterday, to attend the Women in Rural Enterprise (WiRE) annual conference. As anyone who reads this blog regularly will know, I am not one of life's natural networkers but one of my resolutions this year was to try and 'get out a bit more', so last month I took the plunge and joined WiRE. And this month I decided to plunge a bit deeper and attend the conference, a day of speakers and networking at Harper Adams University in Shropshire. Things kicked off with coffee and mingling. I can drink coffee for England but the mingling bit I find harder - and yes I did a fair bit of standing around, feeling awkward. But to make things easier some WiRE members had stands around the room, so there was the opportunity to shop and chat to stall holders. My favourite stand belonged to Sam Morris of Cow Art. Do visit her website if you have a hankering for a cow painting. Sam is lovely. And then early in the day I met Josephine Murray who runs Rains Starts Play, an online children's clothes and toy shop. Obviously we had lots to chat about and it was really nice to find someone with an interest in similar things. The first speaker of the day was Alison Howell, the really inspirational woman behind Foot Trails, a walking holiday company with a difference (think more cashmere socks than hiking boots). She spoke with a real humility about the ups and downs of business life, and I truly enjoyed listening to her. And the last speaker of the day was a lady I already know through social media - Rosemary Jameson from Rosie Makes. Some years ago now Rosie had a section on her website on cordial making and kindly shared one of my little films on her blog. And in between we had more coffee, a talk on PR, lunch and cake, a talk on branding, a Q & A session, and more coffee. And there was a goody bag! Mainly leaflets etc but two exciting items - a packet of seeds from Sage the accounting people (I spent ages wondering what the seeds were before it dawned on me - yes, of course, sage) and a little bag of chocolate coins from another lovely woman, Jo Dale at Flourishing Incomes Streams - she is the woman for you if you want help finding nice clients for your business. Today I have felt a bit exhausted - 6.30am to 7.30pm is a long day out of the house for someone who rarely travels further than the local post office! And I am also feeling quite reflective - the conference raised quite a few questions for me, but that's a good thing, and all in all it was a great experience. Oh, one last thing. I posted a profile on the WiRE website today (which even involved an impromptu photo session so I could include a pic of me and Rudolph - cue an hour of faffing around with camera on timer mode etc) so do have a look. 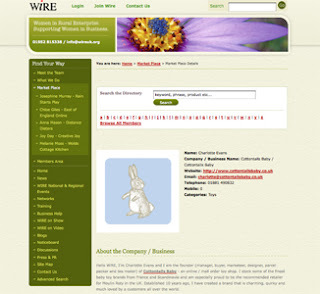 And browse through some of the other members on the marketplace, it's a great business resource. Here, Business Gateway are really useful with free training and free events. Lovely to meet you Charlotte at the conference. Everyone feels a bit awkward at these things, but I am not quite sure what we are frightened off. It was a great day and I am sure that like me, you are glad you made the effort to go and be inspired by such lovely ladies.